XeroxUtil is a utility for interactively controlling PostScript print jobs in realtime. It's based on an enhancement of my previous Xerox drivers but now allows you to change all settings interactively from the desktop instead of manually editing files etc. 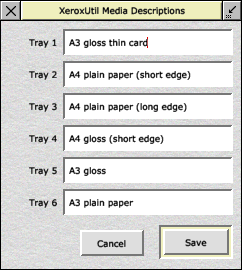 It's currently a mid-way solution to implementing full PPD (PostScript Printer Description) files under RISC OS and as such, includes facilities such as multiple tray selection and duplexing options. Support for several different Xerox printers is provided, along with a simple way of setting various media and finisher options. XeroxUtil was written exclusively for RISC OS Now magazine. It is not yet publicly available. To be honest, I'm not sure if it will ever be publicly available, purely because that would involve giving support and help, possibly for PostScript enquiries beyond the scope of my current knowledge base. I'm also not sure what price to charge for such a utility, as a lot of work and effort has gone into development and testing, but as soon as you charge for anything, then you feel obliged to offer support, which is not something I feel I can adequately provide at this moment in time. For more information, please read my article in issue 4 of RISC OS Now magazine, or contact me. The main window showing the primary controls and settings. If you have finisher options, such as stapling and hole punching, then XeroxUtil will provide a selection of additional facilities for controlling the positioning of staples, with the aid of small thumbnails giving diagrammatic representation of staple and hole positioning. Some of the current advanced options. More are hard-coded into the application, but I hope to move these into this window as development progresses. You can label the various media trays in order to aid identification. 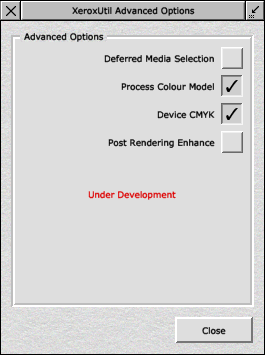 When you select tray from the main window, the relevant media type is shown. 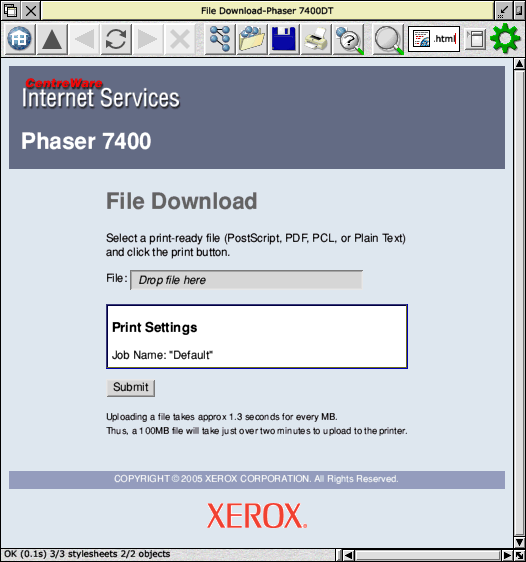 XeroxUtil will also allow you to upload 'Walk-Up' jobs to the printers local hard drive. It does this by generating the relevant web page on-the-fly, in a format compatible with all RISC OS web browsers, including NetSurf. 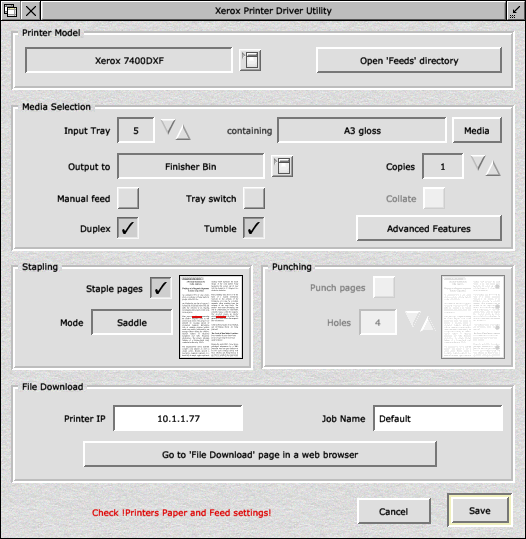 a) Added printer homepage link to main control window. Current development version - in testing/fine tuning stage.